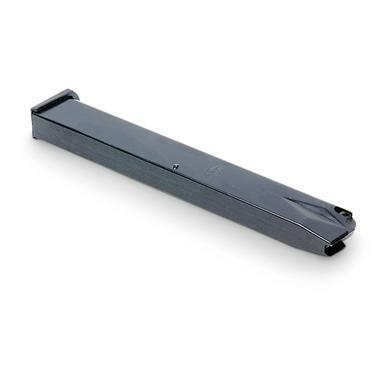 High-capacity replacement Mags by ProMag for your XD Springfield. Heat-treated steel matches the original factory excellence. Black finish. ProMag Springfield XD-9 9mm 32-rd. Mag is rated 4.2 out of 5 by 19. Rated 5 out of 5 by Oct77777 from Excellent 32rd magazine for cheaper than the 16 rd mags. Amazing for the range, I will be ordering more. Rated 5 out of 5 by 44Rick from Great Price Pro Mag makes good quality mags at a great savings. The spring is stiff when loading the last several rounds as can be expected. It appears to be good quality. I wish it had the ports to view how many rounds were left, but perhaps they will incorporate those in the future. Rated 5 out of 5 by chago from good quality for your bucks very good item just a touch heavy when load in gun but you can always compensate to make it work need to used it at firing range. Rated 5 out of 5 by john from cant beat the price solid magazine awesome for home protection/ fun at the range!! Rated 3 out of 5 by Cyclemanc from Nice for the range. I bought the 32 round high capacity magazine for the range, and thought if it was reliable, it would be good to keep loaded for home protection. Unfortunately, after using it at the range, it proved to be too unreliable for home protection. I loaded it with 32 - 9mm Luger 115 gram Blazer ammo and started shooting. The third shell jammed and required me to pull the magazine completely out of the Springfield XD Sub compact pistol to clear it (it was a feeder jam). I then continued shooting the rest of the ammo in the magazine without another jam. I reloaded the magazine with another 32 shells and this time the third shot again feeder jammed, requiring pulling the magazine out to clear it, and then feeder jammed again on the second shot after that. I pulled the mag out again to clear it, and then I shot the remaining ammo without a jam. Both times I emptied the magazine the pistol did stay open (slide locked), as it should, which is good. So like I said, for the range, where a feeder jam is not going to cost you your life, it was ok. After shooting with that high capacity mag, I went back to the Springfield 13 round and 16 round extended mag and did not have another jam after shooting nearly 100 rounds with them. If fact, I have shot nearly 400 rounds without ever having a jam. Anything less would be unacceptable. Rated 5 out of 5 by Terry from Great quality! Rated 4 out of 5 by XDModLB from Great magazine for a fun day on the range and home security. Worked just as a mag should. Feeds just as good as the mags that came with my XD Mod.2 9mm but A LOT more fun to use. I feel bad for those that have had bad luck with these! I have two of them now and I DO NOT regret purchasing either of them. Charter Arms Mag Pug, Revolver, .357 Magnum, 2.2"